Vikram Deb Autonomous College B.ED Admission Notification 2017-18. 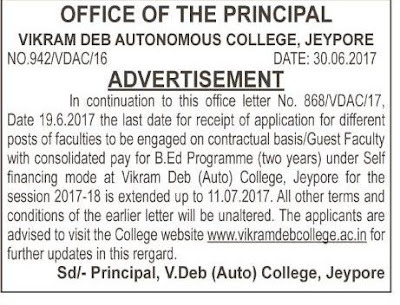 Vikram Deb Autonomous College Published Admission Notification For B.ED Programme of the Academic Year 2017-18. Now Interested Candidates Can Apply through Official Website. Qualification- Any Graduation Can Apply this Course. Selected Candidates List Will Publish On Official Website. Candidates Need to Check Official Website Regularly.